What Will Help the Abdominal Area? Elliptical or Treadmill? When you think abs, think cardio. Both an elliptical and a treadmill can help you lose fat and create definition in your abs. The obliques, which run diagonally across the ribs, and the rectus abdominis, or your “six-pack”, can benefit from the workout on both of these machines. Cardiovascular exercise is performed in a continuous motion for an extended period of time; involving the arms, legs or both at the same time. For better definition in your abs turn to a fat-burning cardio exercise. For your purposes, both the elliptical and the treadmill are good choices. The important thing is that you exercise long enough to achieve weight loss. The treadmill and elliptical are both operated from a standing position on which you have to tighten your abs to maintain good posture and balance. Since you are constantly moving your feet off the belt while running or walking, the treadmill causes you to work your abs slightly more, but you still need to keep your abs tight while pushing and pulling the poles on an elliptical. Good form on both the elliptical and treadmill will have a positive effect on your abs. 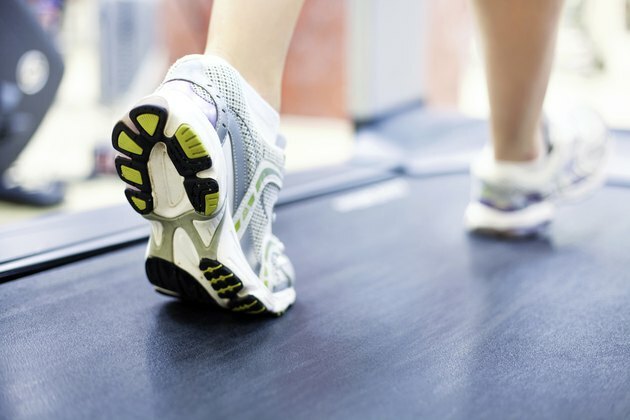 When using the treadmill, never place your hands on the handrail. Only use it when first getting onto the machine. If you lean on the handrail, you will not only take work away from your abs, but you will also cheat yourself out of caloric expenditure. When using the elliptical, keep your feet flat on the pedals, shoulders lifted and back straight. Move your arms and legs back and forth smoothly in an alternating motion. The intensity at which you exercise will have an impact on your ab workout. Whenever you sprint on the treadmill or work out at a faster pace on the elliptical, you are forced to contract your abs with more emphasis than you would with moderate-intensity training. This produces maximal power output during which you burn a higher number of calories both during and after you exercise. The lingering effect of this high-caloric expenditure is called excess post-exercise oxygen consumption. By using the treadmill or elliptical this way, you not only feel your abs working, but you also shed the pounds of fat on your stomach faster. Your best bet is to alternate back and forth from high to low intensity. If you have excess belly fat along with joint problems, your best option is the elliptical. Elliptical machines cause less impact on the hips, back and knees than treadmills. Are Elliptical Trainers Good for Herniated Discs?